go on... what else have you got to do with your Friday night, you will pat yourself on the back come Saturday! I'll be there! Thanks for visiting my blog and becoming a follower :) I'm enjoying your blog too. 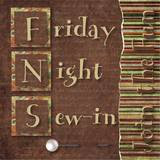 Love your quilting and I hope to join on a Friday Night Sewing, seems something always comes up.